A lift ticket is required to ride the chair to the top. 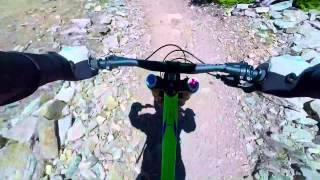 Downhill-only mountain bike trail. No uphill access or hiking permitted. Dropping into Sanitarium, you'll do a high-speed traverse of a ski run before a turn and a steep grade reversal with an optional skinny-to-drop feature. Traverse the ski run in the opposite direction, clear a mellow double, and then tuck into the woods for some chunk. Once you cross under the gondola, it's game on. The famed corkscrew is coming up, but there's a slightly less nutty line down a steep and skinny wooden bridge for those whose screws aren't quite so loose. After navigating the bridge section, cross another ski run and then tuck in for some more chunky tech. There are a couple of especially technical sections that are a ton of fun. Eventually, you'll exit onto River Run Trail.